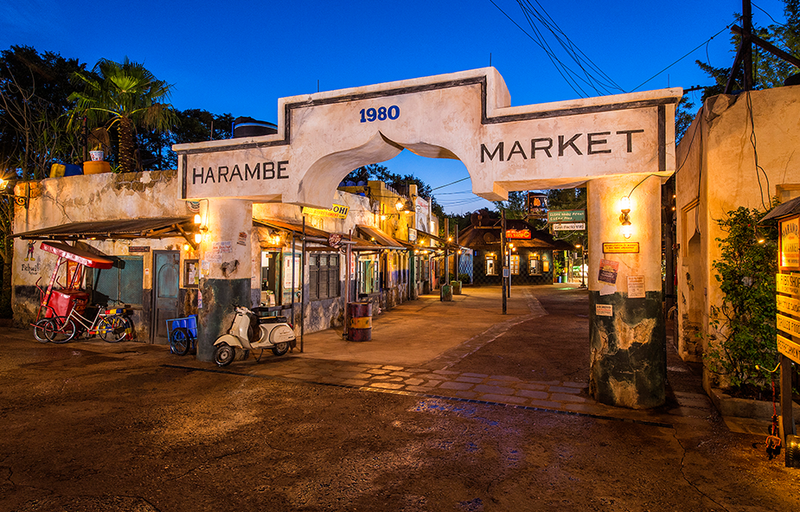 Harambe Market Area at Disney’s Animal Kingdom at Walt Disney World, opened on May 23, 2015. Patterned after an African street market with a Colonial-era train depot design, the area features shaded tables and merchandise shops, and initially opened with four walk-up food windows—Famous Sausages (corn dogs with an African curry flavor), Wanjohl’s Refreshments (wine, beer, and other beverages), Kitamu Grill (skewered chicken and kabob flatbread sandwiches), and Chef Mwanga’s (spice-rubbed ribs with slaw). An additional shop, Zuri’s Sweets (candy, flavored popcorn, candy apples) opened on June 17, 2015.